WE are nominating Linda Shorter Keasling, a member of the K & O Steam and Gas Engine Association, Branch 11 Kansas, for the EDGETA Hall of Fame. Linda grew up on a ranch working with her family. Raising cattle, gardening, canning and all of the many chores of the time were a part of her young life. Linda and her husband, Marvin, joined the K & O Steam & Gas Engine Association shortly after it was first organized. They remained loyal members for many years until Linda’s death in September of 2015. Marvin is still a member. Linda was always a very active member of the association. She and her family had a large collection of John Deere tractors and equipment they took to shows, parades, and other events, along with other members of the club. Linda planned, organized and hosted many bus trips to EDGETA shows and gatherings. Some of the destinations were Texas, Iowa, Nebraska, Missouri and Canada plus many other places too numerous to mention. Linda served as the secretary of the club for many years. Her duties included keeping club minutes and other club data i.e. sending membership dues to EDGETA, co-editing the club newspaper “Old Iron Fever,” and served on various organizational committees throughout the years. She was instrumental in organizing our KIDS DAY event. School children from area schools, school in south central Kansas, and north central Oklahoma were invited to the club’s grounds to view and experience demonstrations and exhibits of past history. Linda’s family showed children how butter was churned, using some of Linda’s personal collection of butter churns and items – many of which are of museum quality. Linda was always involved in planning our annual tractor show. She would organize the club’s Country Store to display and sell t-shirts, caps and other items. The last show she attended and helped with – she organized a special exhibit honoring our veterans and displayed their unique memorabilia. 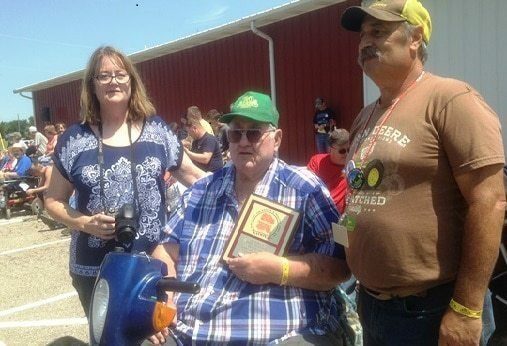 Linda Keasling was a valuable member of K & O Steam and Gas Engine Association. Even if she was not visible, she was always working behind the scenes and always with a positive attitude. Affectionately called “Sparkplug” by the club members – Linda truly was one of the sparks that kept our organization running smoothly. Our club has honored her with a Lifetime Membership. When Linda passed away in September 2015, K & O Steam & Gas Engine Assoc. lost a great friend, member and asset to our club – that is why we now are nominating Linda Shorter Keasling for the EDGETA Hall of Fame.